Glendolene Kimmell, a young woman from Missouri, who was teaching at the Miller-Nickell School at Iron Mountain, Wyoming, found herself embroiled in a deadly feud brewing between the Kels Nickell family and the Jim Miller family. On the morning of July 16, 1901 she went to breakfast at the Miller house where she was boarding, and found a tall stranger sitting at the kitchen table drinking coffee. This man was non other than the infamous range detective, Tom Horn. 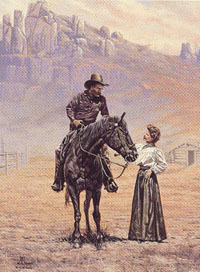 Her attraction to the swarthy range rider was immediate and long lasting. Thursday, July 18, 1901 became one of the most prominent dates in Wyoming history, for Willie Nickell was shot to death at a gate west of his home. The teacher provided an alibi for the Millers, saying that they had been at breakfast at the time Willie was killed. Less than six months later Tom Horn was arrested for the crime. He was hanged on November 20, 1903, the day before his 43rd birthday. Glendolene Kimmell left Wyoming for Kansas City after Willie's murder. She returned only for a short time in a failed attempt to have Tom Horn's sentence commuted to life imprisonment. She stated in an affidavit that it was Victor who had killed young Nickell. The "schoolmarm" disappeared in the dust of Western history, and was last reported to have taught school in Atascadero, California. Exclusive issue of only 250 signed and numbered artist's prints at $175.00 each. Image size - 18" X 24". This painting was used on the cover of the book "Life of Tom Horn Government Scout & Interpreter" by Tom Horn.